Attorney Michael Krone from Kriss Law and Mortgage Master’s Jesse Stein presented the first class in a series four continuing education credit courses to be held at our office. A typically dry topic – “Contract Law”, was presented in entertaining fashion by Attorney Krone. 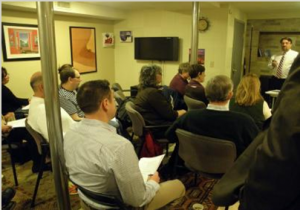 There were 15 Agents from our office and four visitors from the real estate community in attendance who received two credits toward the currently required 12 credits to maintain an active real estate license in Massachusetts. There will be three other classes at our office this year. The next one is on “Title” and is scheduled for June 6th. All in all agents can earn eight out of the required twelve through this convenient class arrangement and better still at no cost!